It was a hot September day in 1876 when Charles Alexander Mentry brought in California's first commercially viable oil well. The location was Pico Canyon, 35 miles north of Los Angeles in the western Santa Clarita Valley. Oil was piped six miles east to California's first successful refinery in present-day Newhall and shipped out by rail. Eventually the Pico oil works were folded into John D. Rockefeller's Standard Oil Co. of California. Production slowed in the late 1920s but didn't entirely stop until 1990. When finally capped, Mr. Mentry's discovery well was the longest continually producing well in the world. Experienced drillers from Pennsylvania came to work the Pico oil field. Bachelors stayed in bunkhouses; family men erected cabins and even a schoolhouse and bakery in the town they called Mentryville. Theirs was the first village in Southern California to be lighted by natural gas. Alcohol consumption was forbidden; the men spent their earnings in nearby Newhall where saloons outnumbered churches. Today Mentryville is a ghost town, its few remaining structures standing as silent reminders of the birth of the California oil industry. The Friends of Mentryville is an independent volunteer group formed in 1996 to help refurbish the town's structures and grounds; compile historical matériel; provide docents for tours; disseminate information; and coordinate public activities. Regular tours were suspended after the 2003 Verdale wildfire and subsequent flooding. (No historic structures were damaged.) Special tours for bonafide nonprofit organizations such as Scouts may be arranged by e-mail. No guide is necessary for you to tour the grounds. Mr. Mentry's famous Pico No. 4 oil well is a National Historic Landmark. 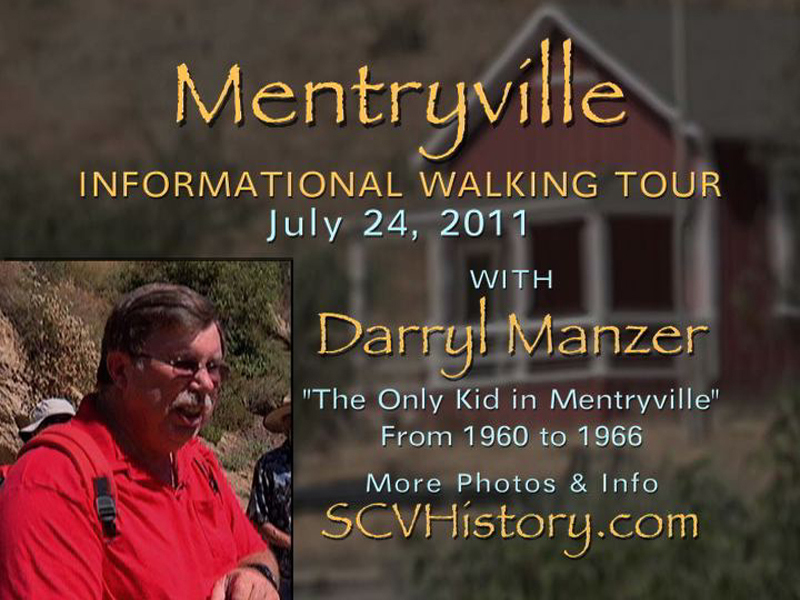 Both the oil well and the town of Mentryville itself are California State Historic Landmarks (Nos. 516 and 516-2 respectively). So is the corresponding Pioneer Oil Refinery in Newhall (No. 172). $5 Parking Fee payable at the "iron ranger"
NOTE: WE DO NOT OWN OR OPERATE THE PARK. WE DON'T HANDLE WEDDINGS, PHOTO SHOOTS, ETC. Mentryville is a state park managed by the Mountains Recreation and Conservation Authority (MRCA). Inquiries about filming, weddings, photography, ect., must be directed to MRCA. Located at the end of Pico Canyon Road off of I-5 at Lyons, Mentryville is an 851-acre state park at the north end of the Santa Clarita Woodlands. The park has been operated since 1995 by the Mountains Recreation and Conservation Authority, a joint-powers authority headed by the Santa Monica Mountains Conservancy. The City of Santa Clarita is a joint-powers partner. Mentryville offers hikers, bikers and equestrians not only a glimpse of California history, but also shaded trails into the rugged and lushly vegetated headwaters of Pico Canyon and the Santa Susana Mountains. From Mentryville, the trail leads to Johnson Park at 0.7 miles, a serene picnicking spot once favored by the oil men who toiled in the fields another 0.7 miles up the canyon. • Learn about the flora & fauna of Mentryville and the rest of the Santa Monica Mountains Conservancy zone.